The Super Bowl was a few days ago. Why should I care about that? I don’t, per se, but it did give me an opportunity to convince all my kids to be home so that we could have a “tailgate party”. I know, there were no gates involved (no tails, either) because we were in our house, and we finished way before the game started. Having 3 teenagers makes it really hard to find time when we can all be together. We don’t even see each other every third Shabbat, like we used to. Shira lives in Jerusalem, and we only see her on weekends. Zahava spends 2 nights a week at school and is in Ariel every other weekend as a Madricha in Bnei Akiva, and Ari is in Yeshiva, and only comes home every 3rd Shabbat. That means that every six weeks we all sit together as a family. That’s not enough for me. Ari came home to see the game. If the Giants, his team, weren’t playing, he would have skipped it altogether. I saw that as a sign, and decided to make a party out of it. I love barbecues, but there aren’t a lot of ready-made vegan foods in Israel to use on them. I make sure to bbq lots of veggies, and I’ve done tofu in the past, but that doesn’t really sound like “tailgate party” to me. 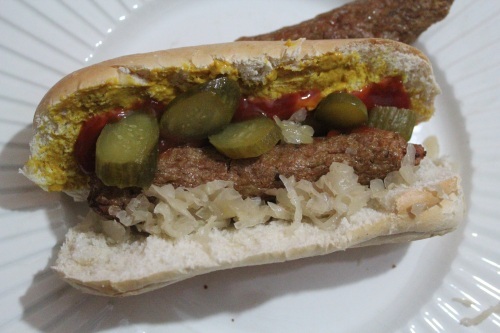 There are no vegan hot dogs in Israel, so I figured that I’d make my own. I love hot dogs. When I go to the US, it’s one of the things that I put in my cart right away when I go to the grocery store. (In case you’re wondering, it’s usually kept in the vegetable refrigerator section in most super large supermarkets. I’ve never been able to figure out why.) Tivol is the big vegetarian company here – vegetarian, but not vegan. They make all sorts of stuff, like hot dogs, hamburgers and breaded patties, but even though they have no milk in most of what they offer, they all have egg in them. I wasn’t going to let that fact ruin my party, so I had no choice but to make my own. 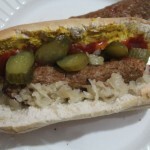 This recipe is based on Jalapeno Hot Dog recipe from the Hearty Vegan Meals for Monster Appetites cookbook. (don’t you just love the name!) Although I’m originally from Texas, I’ve never been able to eat really spicy food. That fact has brought me much shame. I love hot dogs. They are such a fun food. Having them around makes me feel a little less of a freak at family barbecues. Soak TVP in warm water for 10 minutes, until the TVP absorbs it all. Mix in the rest of the ingredients and let gluten get fully absorbed (about 10 minutes). 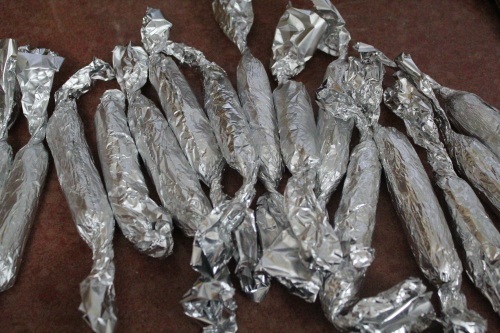 Shape like a hotdog and roll in tin foil. After they’re baked, these hot dogs really don’t need to be cooked anymore, but how could I throw a tailgate party without throwing them on the grill, even for just a short bit of time? Using liquid smoke is a bit of a cheat, I know. I haven’t been able to find liquid smoke in Israel. I brought a bottle home with me on my last trip to the States. If anyone knows where I can pick some up over here, please let me know. I still have plenty left, but next time I go I’m going to make sure to load up on this stuff. It really adds to the flavor. I don’t know when I’ll have all the kids under one roof again. No matter what, if they want, we can do another barbecue, and I’ll be happy to make these bad boys again. I love what you do! It’s so great to see you making easy and delicious vegan foods with sometimes limited choices. You are an inspiration. By the way, I have developed a way to make vegan challah, start to finish, in about 1 1/2 hours. I add some gluten powder to the flour and use fast acting yeast. Do you have that kind of yeast in Israel? I made this and thought they were so good, and so easy to make!!! I used gluten free flour and smokes paprkia instead of regular. The only thing I would change when I make them next is to add an eztra tablespoon of salt. Maybe the gluten free flour effected the salt taste. After they were done I threw it in a skillet for a few minutes with a tiny bit of maple syrup! YUM! My husband is going to love them! This is very very exciting for us, thank you for sharing! I’m so glad that you liked it! I never thought of trying to make them gluten free. Glad to know that it works that way too. Oh boy! I can hardly wait to try this. I’m going to push the mixture through a piece of pvc pipe, for an extruded, so they will be round and smooth and maybe draw less criticism, than just hand rolled. I love hot dogs and I thinbk will give them back to me! Thank you. That’s so cool. Let me know how it goes!